Oh WH Smith, once king of the high street, inventor of the ISBN number, and number one newsagent – where has it gone so, so wrong for you? For the second year running, they’ve come bottom of the Which? Magazine survey of UK stores. Shoppers have been ranking stores according to price, products, service and after-sales support. By comparison, rival bookseller Waterstones has clocked in at 4th – jointly placed with customer service king John Lewis. The overriding complaint from WH Smith customers concerns the “crowded stores and limited stock” and certainly the bargain basement feel of many of its stores contribute to this. Indeed, it took just three comments on The Guardian’s news report before a pot shot on the state of one store. 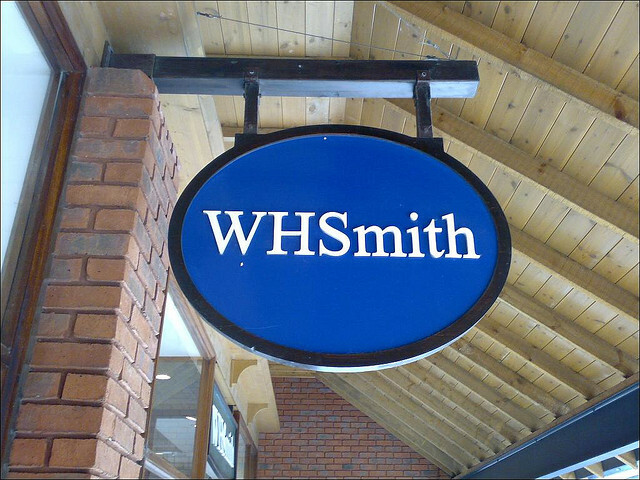 But let’s face it, WH Smith is struggling to keep its head above water compared to Waterstones’ phoenix like rise from the ashes. Cheap books sold on supermarket shelves, and the dominance of e-sellers like Amazon continues to challenge retail footfall for high streets with reports in the early part of 2014 of book sales at the retailer falling 7-8%. Conversely, WH Smith’s travel outlets, typically found in rail stations or airports continued to do well. Arguably, the travel outlets are one of the key proponents keeping WH Smith afloat as customers purchase high margin products such as water, or snacks alongside magazines. But for the high street, WH Smith’s strategy has been rapid and proactive cost cutting to customer’s detriment. DVD and CD ranges have shrunk in favour of extending ranges of higher margin products like greetings cards and chocolate bars – combined with Smith’s ruthless attitude to upselling – it’s a model that has provoked the ire of many customers. Even store sizes have shrunk – the Trafford Centre’s once mighty store is how half the size and a maze of cramped shelves. Those cost cutting measures have resulted in ridicule for the chain amongst its peers – with a Twitter account dedicated to wry commentary on the appalling state of the carpets gathering significant press interest and many followers. Rapidly changing floorspace in shops has also proved problematic for shoppers expectations. Whether it is WH Smith’s controversial decision to incorporate Post Offices into stores, or turn over floor space to the Gadget Shop, or laterally Modelzone, two defunct stores now in the Smith’s portfolio, it is not difficult to draw parallels with the closure of book chain Borders, which similarly ended up a patchwork of concessions towards the end of its life in the UK. The recent acquisition of Funky Pigeon is at least in line with Smith’s product portfolio, but some WH Smith’s stores are unfocused in product range at worst, and bizarrely set-up at best. WH Smith’s stores, unlike those of rival Waterstones often become a confusing mess to navigate. Waterstones have made a clear effort to make their stores a welcoming and logical place to browse. New books, and Book Club books are given pride of place at front of store. WH Smith however continues to have an array of special offers on which often are incompatible with each other. The entrance space of the Manchester Arndale branch for example is currently taken up with pile upon pile of cheaply produced bargain books which have yo-yoed in price between 2 for £10, 2 for £12 and now £7 each since Christmas. Store aesthetics would most definitely benefit from a makeover. A recent excursion in Macclesfield saw me trying to locate a magazine in the local branch. Crammed in amongst the endless reams of Magbooks, special editions and ludicrous numbers of back issues was one tatty dog-eared copy of said magazine. It had only come out two days previous. A quick look at their neglected upstairs revealed an aging clearance section, boxes of toys and a random assortment of DVDs. There’s a lack of care and effort gone into the presentation of product in high street stores that makes walking into a Smith’s store is akin to walking into a jumble sale but a necessity in that town given the lack of newsagents. Upselling may have become a standard part of our culture – but this is another area were Smith’s have so badly got it wrong. Buy a magazine, get offered a pack of Haribo. Buy a book, and why not take home a massive bar of chocolate? Did you take one of the special offer vouchers from the dispenser above the self-checkout? Compare this bullish approach to Waterstones upselling which concentrates on products relevant to books and not making the country, or perhaps even our children fatter. The staff aren’t necessarily all so bad. Some of the staff in the Manchester Arndale branch are actually pretty clued up in the essentials. But they are expected, as many of us are, to be jack of all trades and master of none. This is an area that HMV have got it wrong – the staff need to be as knowledgeable and passionate about their product as their customers are. It’s no wonder that Apple and Waterstones sit near the top of the Which? survey. Something’s got to change before WH Smith’s goes the way of Woolworths, MVC, Comet and many more. The name, once synonymous with quality and a proud heritage has become a laughing stock. With the rebranding of Smiths News to Connect – this once mighty name has got some work to do if its going to revitalise its flagging image on the high street and survive another century. For now, the war of attrition between customers and overcrowded shelves continues.